Holes are the most common feature on parts, so making them efficiently and to tolerances is important in CNC Work. This article is your total guide to twist drills, holemaking, and everything else associated with making holes on CNC Mills. The ubiquitous twist drill was probably the first cutter each of us used, perhaps in a handheld electric drill. While only machinists have end mills, most any home do it yourselfer has twist drills on hand. But there’s more here than meets the eye. Statistics show that holes are by far the most common feature CNC machines make. 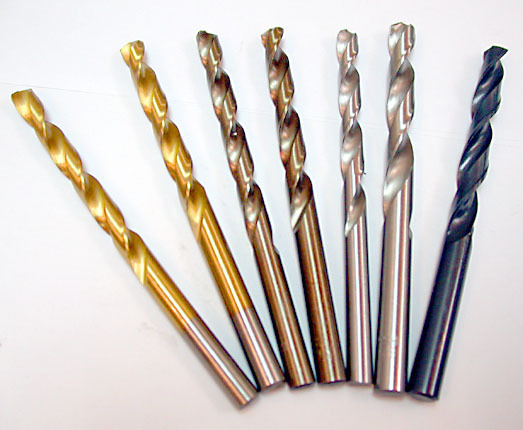 In addition, the Material Removal Rate of twist drills is outstanding, and usually better than equivalent sized end mills. It may even make sense to drill a bunch of holes in a grid over your pocket and then machine the web between the holes out with an endmill. 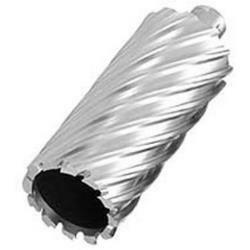 Like endmills, twist drills come in different sizes, coatings, materials, and lengths. Twist Drills come in a lot more diameters and sizes than endmills. This should probably come as no surprise given how popular holes are and how hard it is to use the same twist drill to make different sized holes, whereas endmills can be a lot more flexible. In additional to fractional Imperial and Metric sizes, there are special sizes such as number and letter sizes. G-Wizard Calculator has all this in its Drill Sizes table. If you need the toughness and rigidity of carbide for working tough materials with high productivity, there’s no substitute. For most others, buy a full index of either HSS or Cobalt. I heard of one shop that bought HSS and a box of Cobalts. The Cobalts went in the Tool Crib and were used to replace the HSS twist drills as needed. The assumption was that the ones that needed it were getting a lot of use and were worth upgrading. Coated or uncoated is a matter of preference. Coatings can help but seem to be a little less impressive than on Endmills, probably because most twist drills are not carbide. Screw machine length drill is same diameter but much shorter than the Jobber Length. It’s also much more rigid. Thanks to www.mini-lathe.com for the image. Because they’re shorter, they’re also much more rigid. The hole they make is likely to be more true and you’re less likely to break one. Most machinists prefer to use screw machine length twist drills wherever possible for those advantages. Typical sets of twist drills only go up to 1/2″ in diameter. To drill bigger holes you may want to use what’s called a “Silver and Deming” drill. These bits have a 1/2″ shank and much larger flutes. The shank is kept small so they fit standard drill chucks. A couple of thoughts here. First, standard drill chucks are not very accurate and for CNC Machining we’ll often use collet chucks instead. Second, big twist drills can soak up a lot of horsepower so make sure your machine is capable of driving one in the material and conditions you’ve chosen. G-Wizard Calculator can automatically make the power calculations and warn if your machine isn’t up to it. It will even compensate for your CNC machine’s power curve. Drilling really deep holes is hard. Once the hole is deep enough, it’s very hard to extract the chips while continuing to drill deeper. If they pile up and block the flutes, you’re going to break the twist drill off in the hole, which is always a mess and a nuisance to clean up. One innovation that helps a lot for deeper holes is called “parabolic flutes.” These bits are more expensive than conventional twist drills, but they can go quite a lot deeper and so they’re darned well worth it if you application demands deep holes. “Deep”, BTW, is all relative to the diameter of the twist drill. For more information on parabolic drills, see our blog post on the topic. G-Wizard will calculate feeds and speeds for parabolics as well as warn when your hole is deep enough to require parabolic flutes. Parabolic Drills are great, but they can only take you so far. For a complete Guide to Drilling Deep Holes, click through the link. You’ll be using the heck out of your Twist Drills and nothing is more annoying than a dull bit. There’s a lot of life left in the twist drill if you can sharpen them. Drill bit sharpeners are available at every price range or you can sharpen by hand at the grinder. I use a Drill Doctor which is cheap and cheerful, has all the right adjustments, and makes it super easy to have sharp twist drills on hand at all times. These two are special purpose drills, but their purpose is one we’ll likely use a lot. In theory, there’s no point in using a Center Drill on a mill. Center Drills are intended to create a hole in the end of stock for a tailstock on a lathe. Their secondary “pilot” tip makes them more delicate than spot drills. However, many machinists will grab one anyway if it is handy and use it as they would a spot drill. Neither has flutes that go very far and they are just used to “spot” a small depression for the twist drill to get a good start on. You don’t always need to spot a hole, especially with screw machine length drills. For more information on when it’s necessary, see our blog post on When to Use a Spot Drill. The only good reason to make a hole by plunging an end mill is that there is no other way to achieve the desired result. In general, twist drills are much more efficient at making holes. But, if you need a square bottom hole, you’ll have to use an endmill. Cutting forces go up in a hurry with larger hole sizes. Not much will tax the machine’s horsepower limits more than loading up a great big twist drill, or worse a big spade drill to make a large hole. Cranking a 2″ indexable drill through 300-series stainless steel takes 8HP, for example. Because they don’t have to turn the whole hole into chips, just the circumference, annular cutters can move a lot faster and with a lot less power than an equivalent sized twist drill. Unfortunately, if they don’t go all the way through, there’s no way to extract the slug that’s left, so they’re only good for through holes. The alternative for blind holes (which also works on through holes, just not as fast) is to use an endmill and interpolate the hole. Given just how often our machines need to make holes and the advantages of indexable tooling for end and face milling, it should come as no surprise that indexable drills are available too. These are generally best used for larger holes. Not a lot to know here at the basic level other than to keep in mind that they exist and can save you quite a lot of time on a job. 1. Less power is required. Large diameter twist drills are power hogs. If your spindle can’t put out that much power, you’ll have to interpolate. 2. You save the tool changes. If you have a bunch of different sized holes but each size only has one hole, it may be faster to interpolate because you won’t need to change tools for each size hole. In addition, you won’t be using up the slots in your toolchanger. 3. Big twist drills are quite expensive, especially if you need carbide to work on harder materials. A smaller endmill can be much cheaper and has other uses too. 4. Accuracy of diameter and position may be better with a twist drill than interpolation. 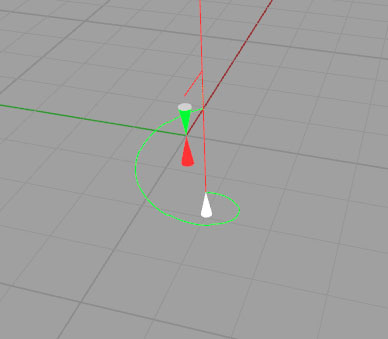 – How to program helical interpolation: Gets into the g-code side of things. Don’t want to program? Try Conversational CNC for Interpolated Holes. – When to interpolate vs use a twist drill. We’ve got two articles that walk you through exactly how to know which technique is better: Part 1 and Part 2. 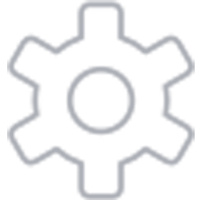 – Make sure interpolated holes are round: When you need to hold tolerances, this article can help. 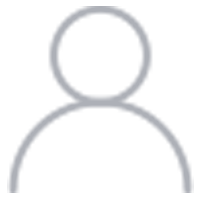 – Optimizing Feeds & Speeds for Interpolated Holes. Trepanning is a process of using a single-point tool to cut a hole. It only works for through-holes, and tehn mostly for shallow sheet metal applications. It’s not seen very often in CNC milling, though for turning, face grooving is essentially trepanning. I see trepanning as a technique that’s handy to have in your toolkit, but you won’t use it much when you could simply interpolate instead. More about trepanning on my page about grinding HSS tools. They require a hole be drilled first that is fairly close to the final size so that the reamer actually removes relatively little material. 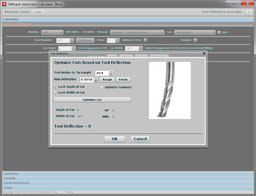 G-Wizard Calculator will tell you what hole size is needed for a given reamer size in the tips section as well as calculating feeds and speeds for the reamer. For more on reamer speeds and feeds as well as pilot hole sizes, check out the article in the link. 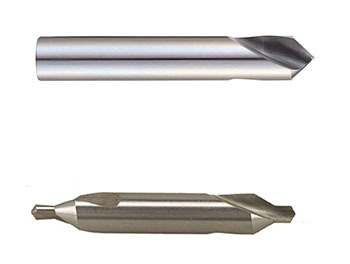 If a twist drill or interpolated hole with an endmill doesn’t produce an accurate enough hole in terms of diameter and roundness or a hole with good enough surface finish, the primary alternatives are Reamers and Boring. For holes too small for a boring head, a Reamer can be the only choice. – Use a reamer with helical flutes if the hole has a keyway or similar feature. The helical flute will bridge the keyway instead of getting caught in it. – Reamers have a long shank so they’ll “float,” which basically means so they can deflect and seek the center of the hole being reamed. – A Reamer with helical flutes may leave a better surface finish by evacuating chips better than a straight flute reamer. Recutting chips is a common cause of wall finish issues. – Use a collet chuck or other toolholder with low runout for a reamer. – CNC’ers use a G85 rather than a drilling cycle for reamers. The drilling cycles rapid out of the hole which can mar the surface finish. Drill Chucks: The best ways to hold your twist drills. Deep Hole Drilling: Roundup of tips and techniques. Gun Drilling & BTA Drilling: For the very deepest holes. Complete Guide to Types of Thread Taps: A one-stop resource you’ll bookmark.